Platon is everything that traditional foundation coatings are not. Platon is made of high-density polyethylene, one of the toughest and longest-lasting plastics. You can count on Platon to continue providing foundation leakage protection for years to come. Platon is 100% environmentally compatible. High-density polyethylene plastic is inert, and leaches no byproducts into the groundwater or backfill soil. Rugged Platon is capable of resisting backfill pressure and typical construction practices all by itself. It needs no protection boards or special curing time. Platon permanently bridges foundation cracks, allowing water no opportunity to sit against the wall or enter the basement. Platon requires no special installation crew and no special equipment. Unlike spray or roll-on materials, its rate of application is constant. No weather restrictions prevent the application of Platon. If you can stand being outside, you can apply Platon to your foundation wall. The dimpled Platon membrane is extra tough, capable of withstanding typical construction backfilling without any problem. With a minimum 24 mil thickness - more than 4 times as thick as standard construction poly - Platon provides a permanent water and moisture barrier along the entire foundation wall. This permanent barrier prevents both backfill soil and moisture from ever resting against the foundation wall, a unique and important step in avoiding basement leakage. First, any soil moisture making its way past the Platon membrane enters the air gap and falls immediately to the footing tile for removal. Water has no chance to enter foundation cracks with this air gap present. It acts like a security system against moisture, utilizing gravity and open space for quick, unimpeded drainage. Second, Platon leaves the porous outside surface of the foundation wall free to breathe and transmit moisture. 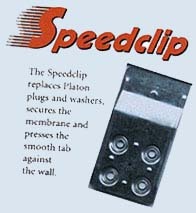 Remember, the Platon membrane provides an external leakage barrier 1/4" from the surface of the foundation wall. Moisture is free to move from inside the basement to the air gap, where it condenses and falls freely to the footing tile for removal. Platon is unique in providing a barrier and venting space all in one. 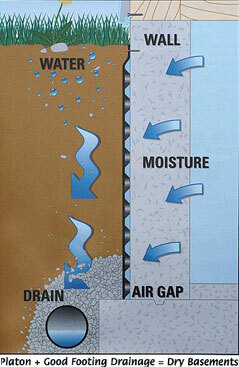 It controls and directs both external and internal moisture, ensuring a dry basement. If you have any further questions, additional help is just a phone call away. Our product experts and network of trained dealers will make every effort to ensure the comfort level of first time installers. Platon can be installed on several different types of foundations. Although Platon is most commonly applied to poured concrete foundations, it is also compatible with insulated concrete forms (ICFs), concrete block foundations, and wood foundations (PWFs). If you haven't tried Platon, then it's time you did! To receive contractor testimonials on the performance of Platon or to talk to a Platon Specialist, please contact Regional Waterproofing. In Canada, Platon meets requirements set by the Canadian Construction Materials Centre and the Building Materials Evaluation Commission as a dampproofing material and drainage layer membrane. In the USA, Platon has NES evaluation as a dampproofing and waterproofing material in the 2000 International Residential Building Code - NER Report #514. ICC Evaluation Service, Inc. (ICC-ES) is a newly created, non-profit, public benefit corporation that does technical evaluations of building products, components, methods and materials. In February 2003, the four "legacy" evaluation services that came together to form ICC-ES were the National Evaluation Service, Inc; BOCA Evaluation Services; ICBO Evaluation Service, Inc.; and SBCCI Public Service Testing and Evaluation Services, Inc.
Visit the ICC Evaluation Service, Inc. for more information - http://www.icc-es.org/.